My father was born on this day, April 26, in 1928. Marking his birthday for the first time since his death last July is bittersweet. My father was a difficult man, he rarely played with us or talked about his childhood—I would not even begin to appreciate why he was this way until I was in my 40s—but he gave me my love of literature. He would regularly run out on Christmas Eve and bring home books especially for me, starting me early on children’s abridged classics: Hans Brinker, Treasure Island, The three Musketeers and my very favourite, Tales of King Arthur and His Knights of the Round Table. I have spent the past few months combing through his library as we clear out our parents’ house. I selected the books that were suitable for donation to charity, decided which were not worth saving, and brought home the books I could not part with. My father loved history, poetry and Russian literature. 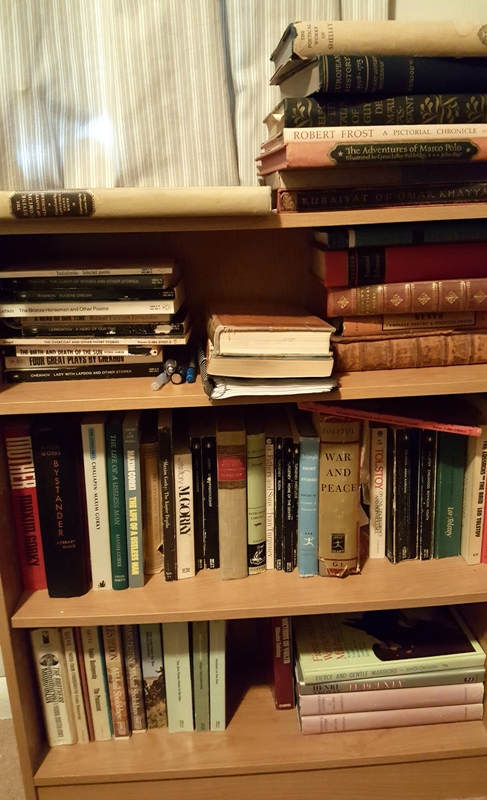 Much of the poetry I had already acquired, piece by piece, over the years; the war history will, I’m confident, find new homes; and I saved for myself his Russian lit (more Gorky than I expected) and his fancy editions of Western literary classics. I have gathered his Russian collection on a small shelf in my office and hope to salvage language from these books to create an experimental composition in his memory. But, as I made my way through his library, I found a few little treasures that speak to his years in New York City in the 1950s—a magical time he was forever trying to get back, long after that New York was gone. He was in his early 30s when he was finally able to attend university. His parents were not supportive of academic pursuits. He studied electrical engineering and would never complete his degree for lack of funds, but while he was at Columbia his great joy was to write for the student newspaper. He reviewed opera and concerts. He would have been well suited to the life of an academic if he had had the support to take an Arts degree. But that was not to be although he would go on to be a highly respected, if difficult, electrical designer and contractor. 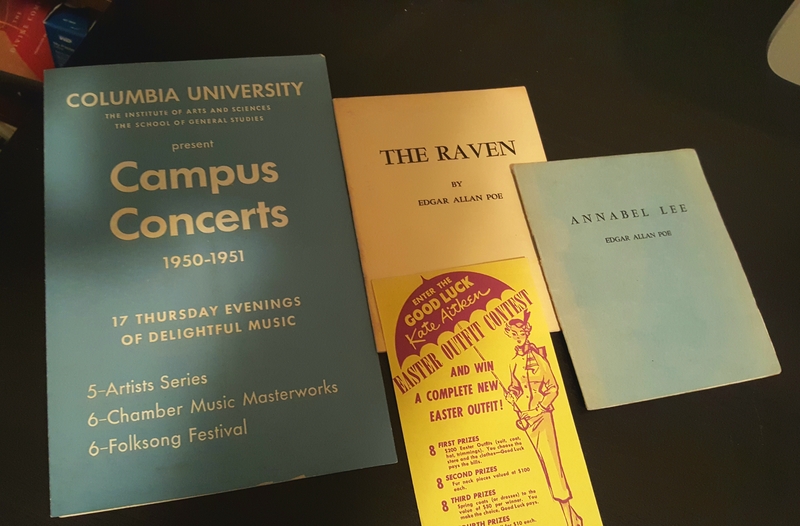 Among his books I found a program of concerts from 1950–51, along with a charming contest entry for a chance to win an “Easter outfit,” and a couple of mini pamphlets of “The Raven” and “Annabel Lee” (the last book he gave me a few years back was a complete collection of Poe’s poetry and prose). The process of sorting through my father’s books, left me with a clear image of him haunting secondhand bookstores throughout his life. My favourite find was a copy of a red hardcover called Modern European History by Charles Downer Hazen. 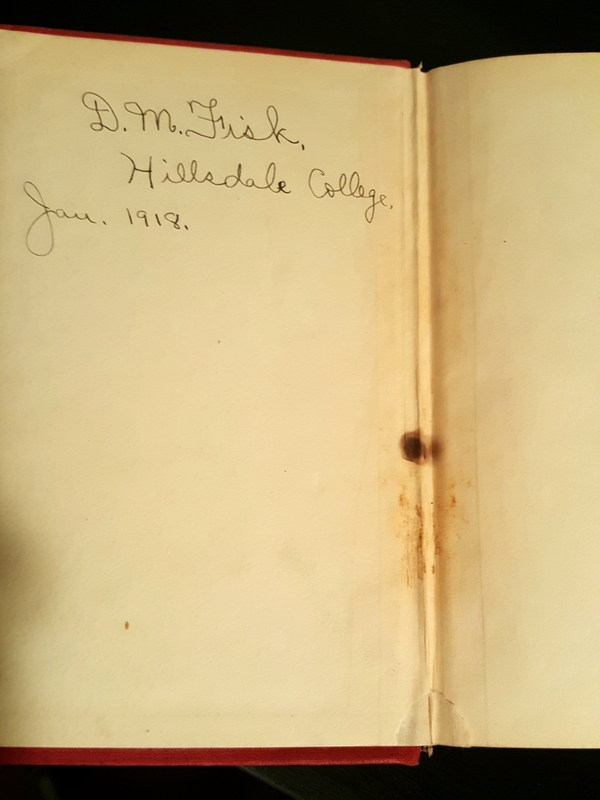 Published in 1917, the first owner left his name inside the cover. I don’t know who accidentally burned through the binding, but my father left calculations inside the back cover—not simply solving math problems, it looks like he was tracking the number of pages he was reading. My father had a thing for numbers, he tracked the temperature and the stock market figures every day right through to the end—not so much out of an interest in the markets as far as I know—but as a little bit of mental exercise. He was afraid of dying and even more afraid of mental decline. I’ll have to keep counting for him. Today he would have turned 89. This is a wonderful tribute to your father, Joe. Thank you for sharing it with us. Thanks Lisa. I could not let his birthday pass without a brief post. My mother’s birthday is May 2, but I am not yet ready to write anything about her. I don’t know if that’s because I have not begun to grieve her properly or because, since we were so close, there is less left unsaid. These things take their own good time, and there aren’t any rules. All I know is that the process of sifting and sorting memories in whatever form you do it, matters more than the product, and that much more of it stays private than it appears. I think this is because the process inevitably involves dealing with regrets and disappointments, with our own imperfections and those of our parents, and coming to terms with those human flaws is a significant part of the grieving process, and we all deal with them in different ways. A lovely piece. Birthdays and other such milestones are always tricky, no matter what the relationship with the one that you’ve lost, but this seems such a fitting way to remember your father. Thanks. So many emotions, but being able to look after his books has been very important for me. Nicely written post. I enjoyed reading it. My love for books stemmed from my mother taking me to the library at a young age. The last few years with her she hadn’t liked my reading habits much as I don’t go out a lot, but this I have is the greatest gift she’s given me and I’m eternally grateful for that. Thank you. The gift of the love of reading is so important. I wish my own children would read more, but computers do seem to hold so much appeal. I enjoyed reading this tribute to your father. It’s funny the things we remember and think about after a parent’s death, the little things we cherish. Thanks for sharing your father’s story. The first anniversaries of birthdays and such are always the hard ones, but what a lovely tribute to your father. And also what a wonderful legacy to have – not just the books themselves, but the love of reading to have received from him. It’s something I shared with my late father and it’s a valuable gift – one I hope I’ve passed on to my children too. And needless to say I think the Russian titles look particularly impressive. My children don’t read as much as I’d like. However, my daughter is quite ambitious in her choices even though, with dyslexia, her reading is slow. My son reads the National Geographics from cover to cover, and some Japanese novels but his real love is poetry, he is forever stealing my books! I loved reading about your father through his books. It’s amazing to think about all the layers there are to our parents, who we think we know pretty well. It seems like there’s always more to discover. I sometimes think about what it is my own kids will know about me someday, and what it is that I want them to know. Thanks. In the end I hope that we remember the best about one another, past all the guilt and frustrations of family dynamics. My parents lived about two hours from where I live. It took three trips to properly sort through it all. I could only matter so much at a time. Beautiful piece, Joe. Our parents are mysteries in so many ways and figuring out their lives, their difficulties, their sorrows, their pleasures — well, books are often the key, I think. I wonder if it’s significant that so many of my father’s books were about wandering…? I only kept a small fragment of my father’s books, but there were a few history books that he clearly read very carefully, underlining and making notes and I kept those for that window into his thinking that they offer. So beautiful. And what a gift your father gave you in reading. What a treasure the books of his you have kept are. Coincidentally, my brother was born on 26th April, 1961. He died in a car accident in 2008. I was thinking of him last Thursday. Many of the books you mentioned in this post brought a smile to my face. What a coincidence! I’m glad my post brought you good memories. A beautiful tribute, Thanks for sharing with us. Thank you for sharing your memories. Your honesty is welcome and touching..and very familiar to me. I can’t believe that it’s been two years since my mother died. I, like you, wrote a tribute two years ago to a parent who loved books on my blog…In Praise of Battered Books…I hope you find the time to read it. This Mother’s Day I again felt the need to honor and remember her and posted a poem I wrote for her shortly before she died. It seems we need a lifetime to come to some understanding of our unfathomable parents. Thank you for your response and for sharing your memories. Sorry for my delay, I was out of the country for a few weeks.